Many departments across the country have embraced Blackinton’s pink badges, pins, and commendation bars, wearing them during October in honor of Breast Cancer Awareness Month. In the process, more than $14,000 for charity has been raised since the start of the line, in 2012. 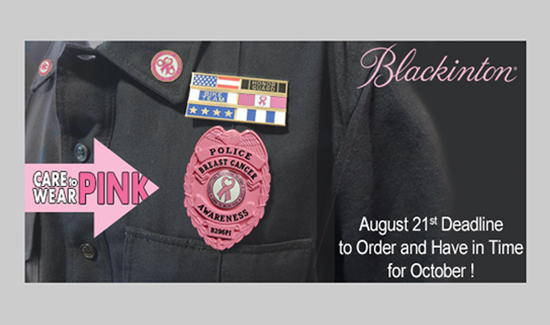 If you or your department would like to help support the cause, visit one of Blackinton’s Authorized Dealers today! Or for additional information about its Breast Cancer Product line please, CLICK HERE.